Now that the weather has warmed and days are longer, we've migrate to the back of the house to the sunny addition, two steps down from the rest of the house with views all around of the backyard. We change our quilt from heavy toasty warm to layers of barely-there cotton blankets. Dried flowers get replaced by fresh greens and buds from the garden. Food changes too. Soups begone! Roasted meats and vegetables are out. Hot cocoa festers for the next eight months in the cabinet. Instead it's salads and platters of antipasti or cold poached seafood and veggies with a warm baguette. Last night it was shrimp with tomatoes, cucumbers and fetah cheese topped with fresh oregano and parsley from the garden (plants that survived the winter). And cold wild rice salad. Strawberries (they've been SO good this spring!) for dessert. Oh, and haul out the barbecue and the pots for boiling corn and clams and lobster, all of which are on sale (finally) at the supermarket this week. I've put away the sherry, my go-to winter cocktail. Sidelined red wine. Now it's chilled whites and roses and homemade Sangria. Also I've discovered hard cider, now with lots of brands to choose from. My current favorite: Woodchuck Granny Smith hard cider. It's the closest to what I remember drinking the first time I had hard cider years ago in Normandy. Not too bitter, not too sweet, very fresh tasting. A revelation. And I confess, I have a soft spot for Budweiser. But only in the summer. And Prosecco is year round. 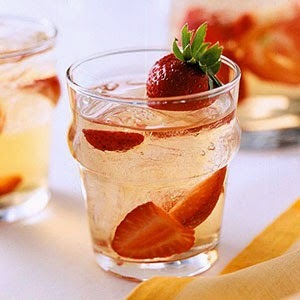 Here's my summer white wine Sangria - cheap, light, not too sweet and goes down easy. DIRECTIONS: Mix first 5 ingredients together, pour over ice (in two 12-oz tumblers, MUCH bigger than the wimpy ones in the picture), and top each glass off with sparkling water. So what about you? Do you eat and drink differently as the seasons change? And if you have a favorite summer drink recipe, please share it! Well, while we stop burning logs in the fireplace when it gets warm, our eating habits change only in that we enjoy summer foods that generally are not available in the winter. But we still eat soups [especially on rainy days] and although we add cold salads to our menu, we don't tend to make any significant changes. Same goes for drinks. Summer brings us lots of fresh vegetables from the garden as does the herb garden, currently well on its way to taking over the front porch . . . .
Oh, we are loving our Bestsellers! And grilled out corn on the cob! That drink sounds fabulous, Hank! And easy. And yes, I'd like a best seller, too please. Got get some pink grapefruit liqueur. Joan, yes on summer vegetables... but not yet at least not here. Other than fiddleheads which I haven't managed to figure out. Can someone explain fiddleheas to me? ooh ooh, I want a bestseller too Hank! Dear Hank, I'd like a "Bestseller" too! We like Pimm's in the summer, with tonic, and tend to eat a lot of cold things (salad, hummus and pita, different cheeses and fruits). I love not cooking. Huzzah for change! I don't make any significant changes in the warmer months. I enjoy soup year-round, as well as hot coffee, hot tea, and hot chocolate. I love fresh fruit and I DO buy more fresh fruit during the warmer months! Both the Sangria and the "Bestseller" sound great. I love to have cookouts. I just love a good burger on the grill. And Corn on the Cob. Nice to move away from the soups, but I do have a simple cold Strawberry/Melon Soup recipe I love. (One half of the bowl is strawberry puree mixed with a bit of cranberry juice and the other half is honeydew puree mixed with lime juice - then in the middle you swirl the two together). DELISH! Pimms. Never had it! Thanks, Susan - putting it on my shopping list along with grapefruit liqueur. THANK YOU KRISTOPHER... boy does that sound yummy... and I love fruit deserts. (One half of the bowl is strawberry puree mixed with a bit of cranberry juice and the other half is honeydew puree mixed with lime juice - then in the middle you swirl the two together). Love the way this will look, too. The cold soup recipes sound SO delish! I have never had (nor have I heard of) GIffard Creme de Pamplemousse rose. What a pretty name! Gotta try. Just make sure to chill the two flavors after you make the purees. The soup is best when it is at its coldest. Then when you pour them into the bowl, pour both sides at the same time and you will get the line in the middle (where you can then swirl it). Creme Fraiche makes a great garnish. Oh yes, we definitely change. In the winter, it's all about the fire in the woodstove and roasts. Summer, we move to the back deck. Lots of grilling (I am going to do cedar-planked salmon on the grill this year - we almost did shrimp last weekend but didn't have skewers). Grilled chicken salad. Fresh veggies. Corn. One of our favorites is to do a giant platter with tortilla chips, seasoned beef and various taco/nacho toppings. We gather around (adults with a glass of Sangria) and nosh. I'll have to try your white version, Hallie. Sounds yummy. And Hank - may I have a Bestseller too please? Oh, Deb Crombie - my dad started Gemma/Duncan and is *raving* about it. Recipe for the wild rice salad? Here on Cape Cod, we have many more people to feed as the weather changes, and since that includes children, we stick to the basics. I am thankful that everyone loves fish, and we get it fresh from The Clam Man several times each week. This weekend gluten free daughter is coming, but she kinda deals with herself. Wild rice salad... easy. Just cook the wild rice (real wild rice -- I just boil it in salted water until it's properly soft/crunchy, then strain. takes about 30+ minutes). Cool. Dress with a strong oil and balsamic vinegar (50/50) mix; salt and pepper. Get fancy: add lots of chopped parsley and toasted slivered almonds. Mmmm. I love red wine sangria. Never order it in a restaurant because mostly what they give you is ice. Mary: A CUP of lemon juice?!? Whoa. Half a cup? Now I have to go look. But it definitely has a dry-tart taste. I did get the rest right. Yes, our food changes in spring and summer. I still may do a hot soup if we get a rainy day, but I make a lot of cold soups in summer: borscht, gazpacho, fruit soup, etc. We eat pick-it food. Things you can eat with a loaf of bread: antipasto, raw veggies, fresh fruits, olives, etc. and lots of salads. Hot tea, coffee, and hot chocolate are replaced with iced drinks. I have many herb pots on my back porch and use them heavily and often. Don't need the bestseller, Hank. I'd be happy to sell a short story or win a contest with one. Thank you for sharing your recipe for sangria. My Mom visited Spain years before I was born. She brought back this wonderful recipe for Sangria but modified it when she had kids. The homemade sangria had red Spanish wine, lots of fruits, and frozen lemonade mix. It was more fruits and fruit juice than alcohol content. I was just thinking yesterday that it was time to put away my winter jackets that are still hanging in the back hall, and then they said it was going down to 47 tonight. Eeek. Meanwhile, the grocery stores are full of stone fruits you never heard of -- pluots and apriots and red apricots and blue apricots, and white peaches and yellow peaches and the fruit section smells divine. So there is now a big bowl of these things in my kitchen. Two days ago I bought a sourdough bread and made tons of Vidalia onion on buttered sourdough bread sandwiches, but I also made dinner of a sourdough heel spread with gorgonzola and accompanied by a red apricot. Now I'm going off to swim laps so that I can counteract all that sourdough bread. Oh, have you ever had a Schaum Torte? Meringue shell filled with ice cream, topped with fresh berries? (Milwaukee food). In August, when the State Fair opens, they sell cream puffs, filled with fresh whipped cream-- you can drive through and buy half a dozen without going to the fair itself. That's usually when my raspberries are coming in: raspberries and cream puffs are the food of summer. That, and bratwurst. (Good for any season, but especially on the grill). (Sorry-- I'm a food writer). I've recently started making Zazas for my summer drink. Ever since it was mentioned during the Queen's Jubilee celebrations. Apparently one of her favourites, and I can see why. Shake the gin & Dubonnet with ice, and strain into a chilled cocktail glass. Sip with caution, because you'll want another. The main food item that I look forward to in the summer months is the tomato, locally grown and fresh at the Farmers' Market. A BLT is back on the menu, and cook-outs with hamburgers have the great finishing touch of a fresh tomato slice. Oh, and fresh green beans cooked in the pressure cooker with a dollop of bacon grease and a tsp. of sugar. Yum! It's Southern cooking at its most delicious. Now, the bad news. I just got diagnosed with ulcers, after an endoscopy, and tomatoes is one item that I need to eat in moderation. I'm trying to sort out a diet that will be good for me, while not too restrictive. Then, I'll get these ulcers healed so I can have my beloved tomatoes in abundance once more. Oh, citrus fruits is another item bad for me right now, which is also most disappointing. Last night when I was out to dinner, I had to say no to a slice of lemon in my water. I guess your Bestseller is going to have to wait, too, Hank. Love the sangria recipe, some guac and chips, the perfect dinner. I certainly eat more fresh foods, frequent the farmer's markets, and once tomatoes start, I have them for almost every meal. I love Lynchburg Lemonade in the summer. Really loved it when the company started making it and I didn't have to buy all the stuff to make it myself ! I find myself shifting to healthier, lighter fare during summer months. Every day now starts with a smoothie. And the ever-popular bread, cheese, & grapes dinner turns up on the dinner menu a couple of time a month, too! Mmm, summer foods and drinks. Strawberry shortcake, anyone? The shortcakes must be made with Bisquick, of course. Nothing else will do, and certainly not those nasty sponge cakes sold in the stores. And with real whipped cream or ice cream, never, ever with Cool Whip, which is nothing but chemicals. We like parsley, and I add great handsful of chopped parsley to salads in the summer, since it keeps growing and producing all season. We also only have potato salad in the summer--the family requests it so much at gatherings that I get sick of it by August, anyway. And grilled asparagus. Is there anything better? Well, maybe a Bestseller! Kathy Reel: giving up summer tomatoes is enough to GIVE you an ulcer... hope they let you eat corn. Kathy Reel, they used to do all kinds of restrictions for ulcers, also even surgery. Then they found out that they are often caused by bacteria and can be cured with the right antibiotics. (But of course, then you need probiotics, so this is a finely tuned dance). (Can also be caused by too much aspirin or similar painkillers). I have a great fondness for Woodchuck Pear Cider. My introduction to pear cider came from "A Fine Romance" by Susan Branch. Books provide not only riches for the brain but introduce us to such wonderful tastes and smells and other sensory delights. My new summer favorite is Calvados Spinach Salad. Toss fresh baby spinach leaves with calvados vinaigrette, gorgonzola, and small chunks of watermelon. I love this post! We live in a century-old house, where the AC is in hit & miss zones, so cold beverages are a must. In NYC last week, I ordered a cocktail called the Dorothy Parker: mercy, it was delish. It was a pink gin drink: if only I knew the other ingredients. But when I asked what was in it, they said: "Gin. And wit." Good enough for me!